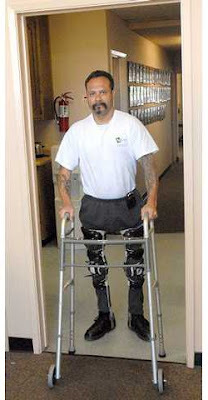 David Blancarte of Manteca, California was 27 when a motorcycle accident cost him the use of his legs. That was in 1988. Then a few months ago Blancarte was bitten by a poisonous Recluse spider. He was hospitalized for five days (Blancarte, not the spider) and during an evaluation, doctors discovered that Blancarte had regained nerve function in his legs. Somehow, the spider bite jump-started his neuro-muscular physiology. He has been in physical rehab since, and is now walking over 250 feet a day with the help a walker. Blancarte's ultimate goal? "I can't wait to start dancing." Mash down here for more about the real-life "Spider-Man".